is an event marketing firm combining event management, fundraising, sponsorship acquisition, and talent sourcing. We help companies grow, charities make money and we connect people. The concept of the Saskatoon Corporate Challenge was started in 2010 and was influenced by other Corporate Challenge like events across North America. Spark provides a new and exciting event that brings the Saskatoon business community together and provides an opportunity for networking while having fun and raising money for local charities. This event is unique to Saskatoon and not a replication of other Corporate Challenges that take place in other cities. The goal of the Corporate Challenge is to provide Saskatoon businesses an opportunity to promote a healthy, team oriented business community through friendly competition while helping raise awareness to local charities. Giving Back – Over $150,000 Donated So Far! In just 7 years, the Saskatoon Corporate Challenge has donated over $150,000 to local charities including Creative Kids, the Children’s Hospital Foundation, Ronald McDonald House of Saskatchewan, the Children’s Discovery Museum of Saskatchewan, the Restorative Action Program, Big Brothers Big Sisters, and the Core Neighbourhood Youth Co-op! This year, the Charity of Choice is the Saskatoon SPCA! 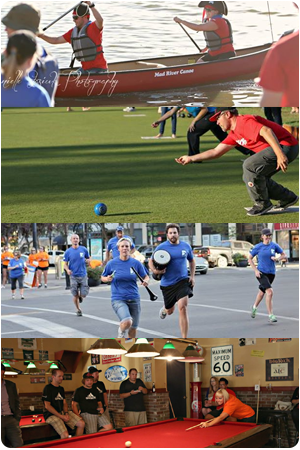 The Saskatoon Corporate Challenge consists of five events that teams will compete in from September 9th – 13th, 2019 plus a Finale Party to wrap everything up on the 13th. Events will be both physical and mental challenges focused on promoting team building and employee engagement. When possible, all events will start after 4:00pm daily. Teams will be awarded points by placing in each event. Teams that finish first will earn the most points and points will be allocated for each place after that. Teams will also have the opportunity to compete for additional awards such as the Spirit Award and Sportsmanship Award. The winning team is determined by the team with the most points at the end of the week. This team will be announced at the Finale Party where the Team Leader will be presented the Corporate Challenge Cup. Our ONLINE Auction is Open! Loraas Disposals Wins the 2015 Snooker Shack Sportsmanship Award!